Dr. Uma Kumar was featured in the Canadian Society for Yad Vashem‘s Year in Review. Dr. Kumar received a CSYV Holocaust Scholarship and participated in the seminar at Yad Vashem in Israel. 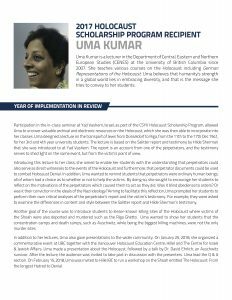 She was able to examine archival resources that she included in her courses, including “German Representations of the Holocaust.” Dr. Kumar continues outreach and has given presentations and participated in community discussions about diversity, the Holocaust, and genocide.